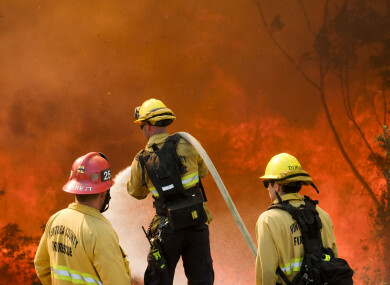 Firefighters battle wildfire near a freeway in Simi Valley, California. THOUSANDS OF FIREFIGHTERS battled blazes in northern and southern California yesterday as body recovery teams searched the remains of houses and charred cars for victims of the deadliest wildfire in the history of the US state. Most of the fatalities have been caused by the so-called “Camp Fire” in and around the town of Paradise which has a population 26,000, in the foothills of the Sierra Nevada mountains about 130 kilometers north of the capital Sacramento. “Today an additional six human remains were recovered, which brings the total to 48. All six of those remains were located in Paradise, and they were located within homes,” local Sheriff Kory Honea told a news conference. “We have teams, you know, coroner teams, that have to go house to house and vehicle to vehicle,” Schuster said. The “Camp Fire”, which erupted last Thursday, has ravaged 130,000 acres of land and is 35% contained, according to California Fire Department. The “Camp Fire” has destroyed some 7,600 homes and 260 commercial properties. Battling the blaze are more than 5,600 fire personnel, some from as far away as Washington state and Texas. The “Woolsey Fire”, which also began last Thursday, has razed 97,114 acres and has been 40% contained. The Fire Department has said that more than 3,500 fire personnel were battling the blaze. The “Woolsey Fire” has destroyed 435 structures including the 100-year-old Paramount Ranch where HBO’s “Westworld” and other popular television shows and movies were filmed. The Fire Department has said that it is threatening another 57,000 structures. On Monday, US President Donald Trump – at the request of state authorities – declared that a “major disaster” be declared in California. California Governor Jerry Brown said that he expects the fires could be worse in the years to come. Email “'A toxic wasteland': Hundreds of people still missing after California wildfires”. Feedback on “'A toxic wasteland': Hundreds of people still missing after California wildfires”.